After eleven years of Federal Government experimentation with ‘practical reconciliation,’ in June 2007, the previous Prime Minister, John Howard and Indigenous Affairs Minister, Mal Brough shocked many policy observers when they announced a ‘national emergency’ in the NT and sought to over-ride the authority of the NT government to intervene in remote communities. Officially, the purpose of the intervention was to address the problem of child sexual abuse identified in Rex Wild and Pat Anderson’s (2007) report for the Board of Inquiry into the Protection of Aboriginal Children from Sexual Abuse, ‘Ampe Akelyernemane Meke Mekarle: The Little Children are Sacred’. The report was cited by government minsters as evidence that Indigenous communities were in deep crisis and that sexual abuse was a major symptom of family breakdown, occasioned by alcohol and drug abuse and the erosion of law and order (Abbott, 2008; Brough, 2007a,b). 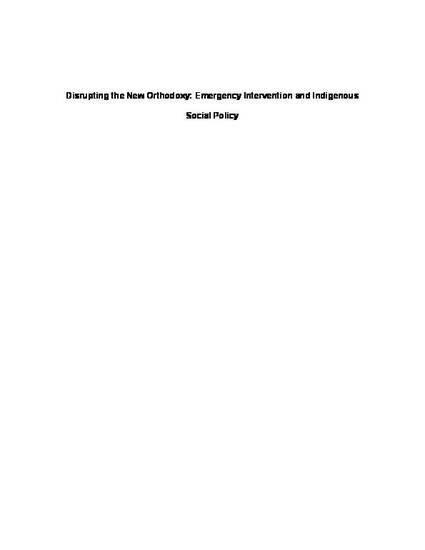 Post print of: Thompson, LJ & Hil, R 2009, 'Disrupting the new orthodoxy: emergency intervention and Indigenous social policy', New Community Quarterly, vol. 7, no. 1, pp. 49-55.